The Songtrails Radio Hour Blog is now up and running. 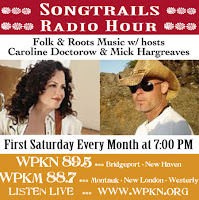 This is the radio show I host with Caroline Doctorow the first Saturday of every month on WPKN 89.5 (Bridgeport) and WPKM 88.7 (Montauk), streaming on the internet at WPKN.ORG... and on iTunes. See the blog for links to all listening methods!